Bret Harte wrote "Outcasts" in 1868, a short story about people which are thrown out of a town because they are not considered good citizens. While they are stuck in a cabin during a snowstorm with little food, fighting for their lives their best feelings and actions come through. By choosing "outcasts" as heroes, Harte was leading the way for so many books and films that were yet to come. This film is based on Harte's short story. 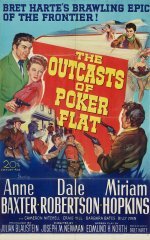 Dale Robertson is Oakhurst the gambler, Cameron Mitchell is Ryker the man who robs the bank, Anne Baxter is his woman, there is also "The Duchess" and the drunk. A couple shows up in the cabin, the woman pregnant, on their way to get married, and they also get stuck in the storm. At a certain moment when Ryker is threatening them all with his gun, they begin to ponder why they should be afraid of him when they will probably die in the storm anyhow. The black and white cinematography blends well with the mood of the film.